I guess I'll be able to claim that I write for Nature now. Read more! I wasn't going to post on this here, lest find myself turning into Denyse O'Leary, but yesterday I posted at BPSDB about Le Canard Noir having his website closed down because he was rather critical of someone. But, I wanted to point out Dr.* T's post on the matter, where he presents Netcetera, Le Canard Noir's former web hosts, with an award for Spineless Caitiffery. Wonderful. Try it out. Roll it around the tongue a few times. And then look at Dr.* T's post to find out what the hell it means. By the way, buy my book. Read more! A couple of years ago a physicist at the university complained to me that he was in a building called Physicum, but that I was in the building next door, called Exactum. He really didn't appreciate the implication that they were inexact. I, with my statistician's had on (it's shaped a bit like a pith helmet), found this hilarious. As it's already been revealed, I turned 38 today. And what a great day it's been! This morning I was awarded the Bob O’Hara Award for Excellence in Blogging on Pseudoscience. The prize is that I'm allowed to post on the BPSPB webpage. I know, I know you're all envious. Later, I was invited to join another blog swarm, of which more later (if it happens). Even the editor of Heredity wanted to send me a birthday present (although I'll have to write an essay about it later). Even lunch was exceptional. I chatted to a colleague about such things as making swords and using pizza to demonstrate theorems. We ended up working out how to use spaghetti to solve the travelling salesman problem. Even The Beast has been great. This morning he enjoyed the wildlife outside, and after I fed him this evening, he demanded a heavy fussing session. What more could one ask for in life? Well, that was a shock. About a month ago, Bill Dembski put up a post on his blog saying that he had some ID predictions, but what about other people? This generated a lot of discussion (over 200 comments), but little in the way of predictions. And we were all left wondering if Bill actually had any. Ah, this old canard. Afarensis has had a go at this one, and it also has a potted rebuttal in the Index To Creationist Claims. But I think there is one point worth adding. We're told that ID only asks whether there is a designer, but it says nothing about the identity or properties of the designer (which is good. They'll be embarrassed when they find out Ididit). But this prediction about junk DNA assumes a rather pragmatic designer who wouldn't put something into their design unless it was functional. What if the designer was slightly odd, and just wanted to throw something in for the hell of it. Perhaps the designer just wants to say 'Alu to us all. This is only really an ID prediction if one makes articular assumptions about the designer. For example, that it doesn't care what colour the wheel should be. (2) Many systems inside the cell represent nanotechnology at a scale and sophistication that dwarfs human engineering. Moreover, our ability to understand the structure and function of these systems depends directly on our facility with engineering principles (both in developing the instrumentation to study these systems and in analyzing what they do). Engineers have developed these principles by designing systems of their own, albeit much cruder than what we find inside the cell. Many of these cellular systems are literally machines: electro-mechanical machines, information-processing machines, signal-transduction machines, communication and transportation machines, etc. They are not just analogous to humanly built machines but, as mathematicians would say, isomorphic to them, that is, they capture all the essential features of machines. ID predicts that the cell would have such engineering features; by contrast, Darwinian theory has consistently underestimated the sophistication of the machinery inside the cell. Somewhere in there there might be a prediction. Ah, found it. It's that "machines" in the cell and human-built machines have the same essential properties. Like being designed by humans, or having their primary structure determined by DNA. Any questions? The analogy between the different types of machine is just that - an analogy. It isn't perfect - human designed machines aren't coded by DNA, and aren't parts of structures that start dividing and reproducing. A problem, then, is how do we know when the analogy has gone too far? If we take Dr. Dembski at face values, it never does. (3) Conservation of information results (also referred to as No Free Lunch theorems, which are well established in the engineering and mathematical literature — see www.EvoInfo.org) indicate that evolution requires an information source that imparts at least as much information to evolutionary processes as these processes in turn are capable of expressing. In consequence, such an information source (i) cannot be reduced to materialistic causes (e.g., natural selection), (ii) suggests that we live in an informationally open universe, and (iii) may reasonably be regarded as intelligent. The conservation of information counts as a positive theoretical reason to accept intelligent design and quantifies the informational hurdles that neo-Darwinian processes must overcome. Moreover, ID theorists have applied these results to actual biological systems to show that they are unevolvable by Darwinian means. ID has always predicted that there will be classes of biological systems for which Darwinian processes fail irremediably, and conservation of information is putting paid to this prediction. OK, Dembski works on evolutionary information, so I guess we should have expected this. But it's not clear what the NFL theorems have to do with conservation of information - they say that blind search does not better than any other search strategies when averaged over all fitness surfaces, but some of those fitness surfaces will look very strange. And in reality, evolution works on a small set of such surfaces, which similar properties (I'm in a bit of a rush, so I won't dig out any links just now). Dembski did produce one manuscript claiming conservation of information, but his proof was to assume "for consistency's sake" that p1 <>2, and then prove log(p1) <>2). I never did get an explanation for what he meant by "for consistency's sake". So, there you go, about we would expect 0 out of 3. Of course, I'm biased, so Iäm suer the UDites will score differently. Read more! A couple of weeks ago I blogged about a paper on the (possible) effect of double blinding on the bias against female authors. The paper had stirred up a few other comments, which got me thinking a bit more about why I'm a bit sceptical about double-blind reviews. Then I started thinking too hard, and ended up playing around with a simple model. It's generally agreed that there is a bias towards better-known authors, so that a well-known author is more likely to have a manuscript recommended for acceptance than someone unknown. The argument for double-blinding is that it removes this bias, because the referee doesn't know who the author is. The problem with this is that it is often possible to guess who the author is (hell, it's sometimes possible to guess who a reviewer is) - a study 10 years ago (Cho et al. 1998) found that reviewers could work out the identity of the authors in about 40% of cases. Presumably the authors who are recognised are the better known ones. We therefore have a situation where fame (whatever it is exactly) affects both whether a paper will be recommended for acceptance, and also whether the authors will be recognised. What effect does this have on the pattern of acceptance? Rather than just indulging in arm-waving, we can build a model, and indulge in arm-waving with numbers! The model is simple, but hopefully captures the main points. Each author of a manuscript (for simplicity I will assume that each paper only has one author) has a fame. If the author's identity is known to the reviewer, then the probability of acceptance increases with their fame (the solid black line below). 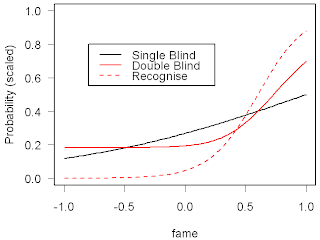 If the reviewing process is double binded, then the probability that the author is recognised increases with the fame (the red dotted line). Note that it starts from a lower point, but increases more rapidly. if the author's name is not recognised, then the probability of acceptance is equal to the minimum probability. This is the the solid red line. The technical details are below, for those who care. I have also scaled the probabilities of acceptance, so you can see them. What does this show? Well, if you're a nobody, then the double-blind process means that you do as well as anyone else who isn't recognised, i.e. all but the famous. The famous do well under both systems, as they're recognised anyway. The people who lose out are those in the middle: the ones who are just starting to make a name for themselves, but are yet to be well known. With single blinding, their fame is enough that it helps them. Under double-blinding, though, they are not famous enough that they are recognised, so they are treated the same as a novice. What this suggests, then, is that double blinding doesn't remove the biases: it just shifts them. So, the very famous actually do better under double blinding, as do the very obscure. Playing around a bit with the model suggests that the general result is robust, but it depends on the probability of recognition starting lower and having a steeper slope. This is a model, using numbers that were plucked out of the air. But how does it compare to reality? My guess is that the effects are not as severe as shown here, but what is needed is data which can be used to estimate the parameters of the model. In the mean time, I'm not going to submit to any double-blind journals until I have my FRS. The final probabilities are normalised, so that they sum to 1, by dividing by the sum of the probabilities. Cho, M.K. et al. (1998) J. Am. Med. Assoc. 280, 243–245. Things are getting interesting over at Uncommon Descent at the moment. DaveScot is trying out a bit of implicit racism, by pointing out that Barack Obama's middle name is Hussein. Whilst this is going on another poster there, who goes by the moniker "idnet.com.au" has decided to practice his quote-mining. and decided to "blog" about it. This consisted of excerpting a few quotes, without any commentary or indication where he had cut the text. In all he took about 20% of the full article so it looks like he's breaching copyright, the naughty boy. This might be excusable if he's accurately representing the article. Well, let's take a look and see (you can guess the result, can't you?). Since Darwin we know that we must explain organisms not only in mechanistic terms (of mutation, selection and adaptation on the population level) but also in historical terms, as ‘descent with modification’, evolution in phylogeny. Because phylogeny is the outcome of developmental processes in populations, all heritable morphological changes derive from developmental changes in molecular control hierarchies and networks. Since Darwin we know that we must explain the elephant not only in mechanistic terms (of mutation, selection and adaptation on the population level) but also in historical terms, as 'descent with modification', evolution in phylogeny. Molecular changes hundreds of millions of years ago constrain the possibility of change here and now. Not everything is possible, and evolutionary history is as much a story of constraint as functionality. Leonardo's 'flying machines' didn't just fail because bodies of a human size and weight fall under physical scaling laws limiting how big muscles could become. The evolutionary history that led to our present body size also stops us acquiring wings, either now or any time soon. OK, so he's changes "the elephant" into "organisms", which is forgivable as "the elephant" only makes sense with the first two paragraphs. But where is the "Because..." sentence? Oh, the middle of the next paragraph. This idea has been refined over the years in cogent discussions of 'evolvability', but there are few specific examples in metazoans where we can assign major structural changes to specific gene-regulatory causes. There are few specific examples in metazoans where we can assign major structural changes to specific gene-regulatory causes. Recent studies on vertebrates suggest that only a fraction of ‘ultra-conserved’ CRMs are active and absolutely required for the animal to survive. Some CRMs might modulate the activities of others, so their effects might not be apparent. As CRMs were assayed at only a few embryonic time points, the absence of regulatory information cannot be construed as a lack of function. It is not clear when, and in which cell types, organ-system specific CRMs are expected to be active, so inferences from such studies should be treated with great caution. The sentence Noel leaves us with is further down the paragraph, in a discussion of the effects of deleting CRMs - it's explaining why we might not see a big effect if we do simple knock-out experiments. (Ha! It implies that development is not be irreducibly complex, so I can see why he might want to leave that out). I could give more other examples, but I think the point is clear. Noel has picked out the comments about how we are uncertain, whilst ignoring all the parts which explain what has been done, or pointing to areas of future research. The whole article is actually positive, in that it's showing the sorts of things that could be done in the near future, with as the new technology and levels of inquiry they allow become applied to evo-devo. But UDites only get a partially copied, mis-represented version of the paper, which might interest Nature's Lawyers as well. Ah well, it could be worse for Noel. He might have used the "Blogging About Peer-Reviewed Research" icon. EDIT: 1. Added Mister DNA's spiffy graphic, 2. The original post has been on a heavy diet: it's only a third the size it was, and makes even less sense. Some of the quotes highlighted above have disappeared. So now this post makes even less sense.